As a collector of library ephemera and memorabilia I'm always happy to find items that connect me to library workers of the past who engaged in the same kinds of activities that I took part in during my library career. I recently acquired three badges for American Library Association conferences that took place in Detroit, MI (1922); Hot Springs, AR (1923); and Saratoga Springs, NY (1924). 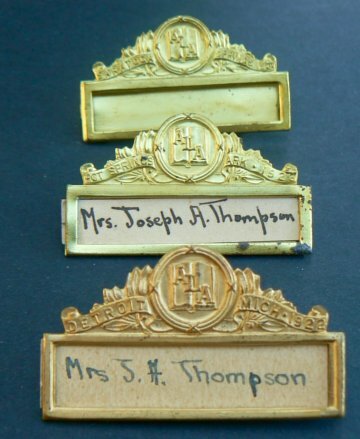 All three of the badges belonged to Mrs. Joseph A. Thompson. It took a little Internet sleuthing, but I found out a few things about Mrs. Thompson other than the fact that she attended at least three ALA Conferences. Mrs. Thompson was the first Librarian of the Chickasha (OK) Public Library starting with the completion of Chickasha's Carnegie library building in 1905 when it was still part of the Indian Territory. She was a charter member of the Oklahoma Library Association which was founded in 1907, the same year that Oklahoma Territory and the Indian Territory became the state of Oklahoma. She served as Secretary of the Oklahoma Library Association for a period. Mrs. Thompson's ALA activities included serving on the 1921-1922 Membership Committee which presented a report at the 1922 Detroit conference. It is interesting sign of that period that all the references for Mrs. Thompson used her husband's name and I couldn't find any reference to her own given name [thanks to Barb for discovering Mrs. Thompson's given name was Sallie Lou]. The three metal badges are interesting. There is a slot for the name tag to be inserted. The hand written name tags for Mrs. Thompson were pretty small and you would definitely have to look hard to read them. The name tag for the Saratoga Springs Conference is missing. A brief history of the Chickasha Public Library is located HERE. Alright, these are what i want MY ALA badge to look like. Cool find Larry! Very cool. I'd actually heard of her from a library director who started working in Enid, Oklahoma about 30 years later, but outside the context of your post I wouldn't have remembered. Larry, how did you come by these? I'm not trying to poach your source--just curious! I have a big glass jar on my desk where I toss my conference badges, ribbons and all....but I guess many years will have to pass before they gain historical interest. Nann, I bought these on eBay which is where I find many of the items I collect. I also have a badge for the 1927 ALA conference in Toronto. This one wasn't a Mrs. Thompson badge. It is similar but more elaborate. Larry, a quick check of the 1910 US Census shows Mrs. Thompson as Sallie Lou. She lists her profession and librarian, Carnegie Library. Thanks Barb for taking time to discover Mrs. Thompson's given name. What a treasure (person and badges)! I have a list of people from the 1923 Hot Springs Conference whose badges I would love to fine, namely Thomas F. Blue, Ernestine Rose, and Mary Utopia Rothrock! It's too bad that the original Carnegie Library-Chickasha, where Mrs Thompson worked at all those years was "condemned" and "razed" in 1963 - some 50 years ago according to the link above. at least her badges survived have you thought about donating them to the Chicasha Public Library today or to ALA archives ? or even to the Oklahoma State Library would be nice to have there. That's it. I am officially advocating for the return of these at ALA 2013. That, or a decorate-your-badge table in the exhibit hall, complete with stickers and glitter.